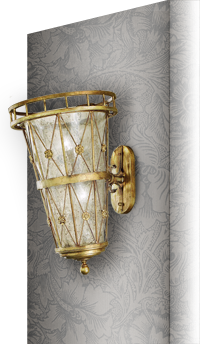 The Chandelier Company prides itself on offering the widest choice of interior wall lights available in the world. We will also manufacture any wall light to the specification of our customers. So if you see something you like, but need it with different crystal, or a different finish, with more or less lights and a different size, don't worry. We will make it for you. All our wall lights are manufactured by some of the best and most experienced artisans in the lighting industry today. They come in a huge range of materials, can be finished in gold, silver, chrome or brass. We have examples of coloured or clear crystal, using Swarovski or Asfour. If you are seeking the very best wall light at the most competetive price, browse our huge range of wall lights and we feel you will certainly find the very thing you're looking for. Range of lead crystal and cut glass dressed wall lights. Available in a choice of finishes including gold, silver and chrome.